Microsoft working on its own Tegra-powered superphone? Doubtful. When MSI rolled out its v1.09 BIOS, we’re willing to wager it absolutely did not have anything like this in mind. The mad scientists in Team Australia are at it again, this time overclocking a netbook to the point (almost, anyway) of implosion. 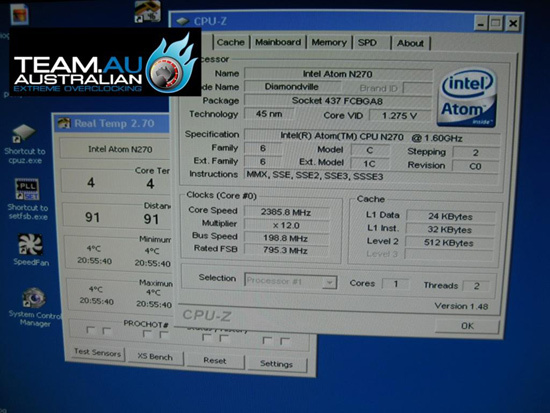 The unafraid members grabbed hold of a hopeless Wind U100 with 2GB of RAM, hooked up a little liquid nitrogen and proceeded to push the poor 1.6GHz Atom N270 CPU to an amazing 2.385GHz. No telling how quickly the whole thing was over, but still, this is pretty ridiculous, mate.